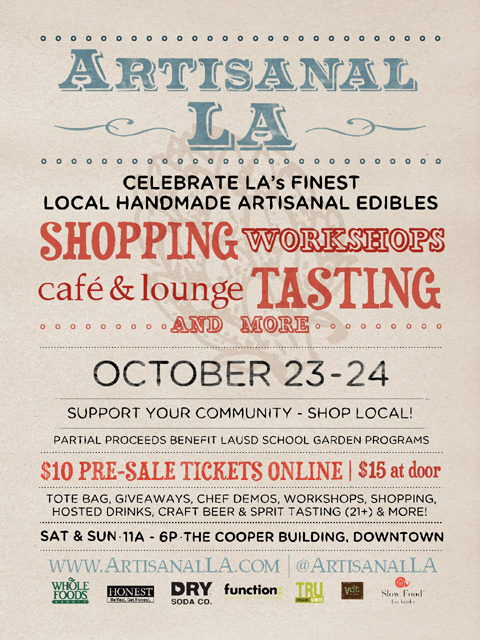 On Saturday and Sunday, October 23-24, Artisanal LA invites Angelenos to spend a weekend shopping, tasting, and learning about the city’s finest local, sustainable food and beverage artisans. Taking place over two days in the penthouse of downtown’s historic Cooper Building, Artisanal LA gives attendees the opportunity to shop from nearly 100 up-and-coming vendors, many of whom aren’t yet accessible through retail stores or even through farmers markets. $10 presales available online through Eventbrite. $15 day of event at the door (cash only), capacity allowing. Event organizers expect attendance to be around 5000 over the two days, so presales are strongly encouraged. For a full list of vendors, event schedule and other information, visit ArtisanalLA.com.